Getting from Pangkor Island to Georgetown, on Penang Island, was a simple 20 minute taxi-40 minute ferry-3 hour bus-20 minute ferry-10 minute taxi ride. Actually, it did seem fairly simple and fairly pleasant. We all snoozed on the (apparently) bug-free bus. We enjoyed the views on the ferry, particularly the large one that took us from Butterworth to Georgetown. Both are mid-size cities. 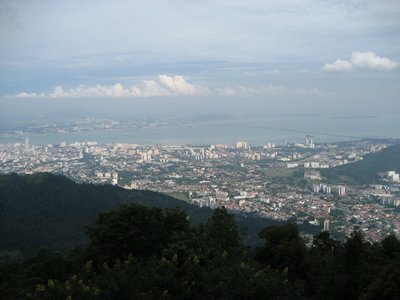 It also afforded us a view of the 13.5 km causeway linking mainland Butterworth to Pulau (island) Penang. Our cabbie in Georgetown pointed out both colonial architecture and many, many hotels that would be better than the Hotel Mingood, where we'd asked him to take us. This seemed suspicious. Sure enough, the Mingood was just fine, our first actual hotel on the trip, and a bargain at about $30 Canadian per night, including a nice breakfast in their rooftop garden room. That evening, however, we didn't notice much for dinner walking down Jalan Penang, and ended up at the mall beside the big communications tower. It was early for dinner, but our travelling had meant we'd missed lunch. We ended up at a pretty bland restaurant where the staff was ridiculously eager to please. The next day, fortified by the complimentary breakfast, we were ready to see Georgetown in our only full day there. We had a brochure of a historical walking tour, and off we went. It was early, but already getting hot. 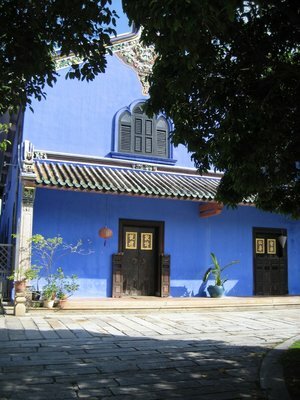 We examined the blue mansion (remember Indochine with Catherine Deneuve? 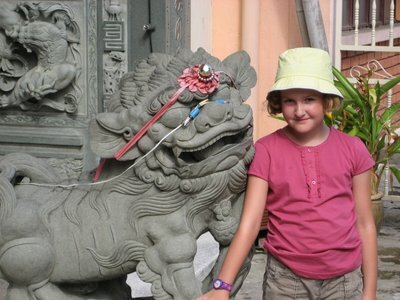 ), and paid our respects at a Hainan Temple (Chinese). Very elaborate and colourful. Anica said we should stroke the lion's paws for good luck. Was she making this up, or had she read it somewhere? We stroked the paws anyway. Soon, the heat was getting to everyone. Walking for hours maybe wasn't the best idea for the day. The mantra became: get to the Fort. 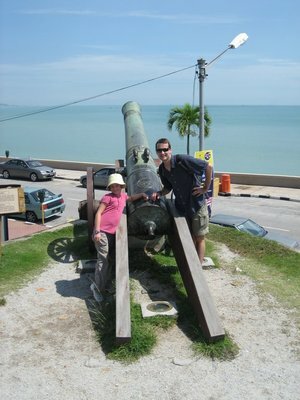 By high noon we'd reached Fort Cornwallis. We paid the nominal entrance fee and cooled down before exploring this legacy of Francis Light, where it all began for the Europeans on Penang. Mostly, it was fun stuff, like locking Anica in one of the cells, posing with the musket, strolling past the "wild" horses, hunkering down in the gunpowder magazine. But we did learn a lot about Light, including the matter-of-fact details about his slaves, and the interesting life of his Siamese wife. The first wedding in the fort's chapel was the wedding of Light's widow. We took refuge from the heat at a hawker centre of food stalls beside the Fort. Just then we ran into a Belgian family from our hotel whom we recognized from breakfast. We got a nice big table and ate lunch together. Anica played with their little 3 year old girl. 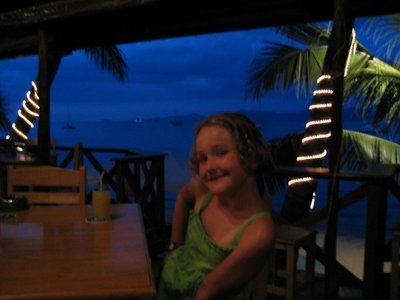 She only spoke Flemish, but their parents spoke very good English, and we traded travel tips and email addresses. 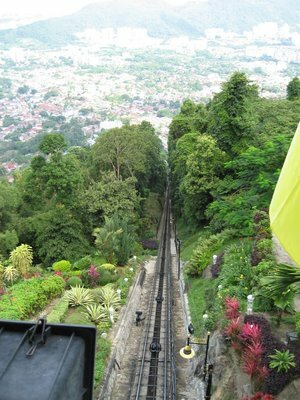 The afternoon couldn't possibly involve more walking in the heat, so I suggested a trip up Penang Hill on the funicular railway. This, too, turned out to be a hot and sweaty ride, and quite a lengthy process. I forgot about Jenn's low-key fear of heights, but she managed admirably. The views of the island were magnificent. This "hill station" is at about a thousand metres above sea-level. It's a whole village at the top, starring the Macaque monkeys, but also including a Hindu temple, a Mosque, and some great lookout spots, of course. And, it was cooler up there. The railway and many of the buildings date from the 1920s, when Penang Hill was a fashionable escape for Malaysia's F. Scott and Zelda set. For dinner, we actually ate at a sit-down Indian restaurant that was entirely indoors. In other words, a touristry sort of place. Anica kept pointing out how many of the diners were white people. It was good food, though, and we did get to eat on banana leaves instead of plates, which was a nice nod to Indo-Malaysian authenticity. Our final morning at the Hotel Mingood was spent taking advantage of the free wireless, reading, and waiting for our flight time. The employees were very nice, even giving Anica a piece of their Domino's pizza. 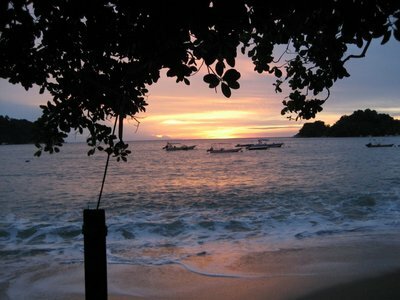 We moved to Pangkor Island a day early and it was the best decision we could have made. 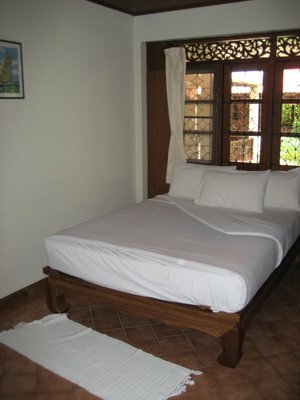 Our resort here, Nipah Bay Villa, is simple but clean and lovely, like our place in Melaka. For 37 CDN a night, we have our own bungalow, air-conditioned, with a king-size bed, a single and attached bath, where the shower is an actual stall "area" of its own. We have toilet paper (whee! ), blankets and coverlets and actual television even if we only get two channels. 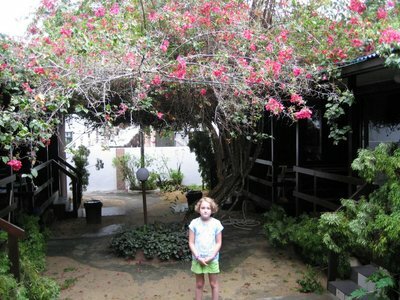 Our bungalow fronts on a courtyard area with a beautiful tree that blankets the rooftops with its branches and our paths with its flowers. There are assorted frogs, cats and geckos to keep us company and a rather large black and white bird with a double bill. 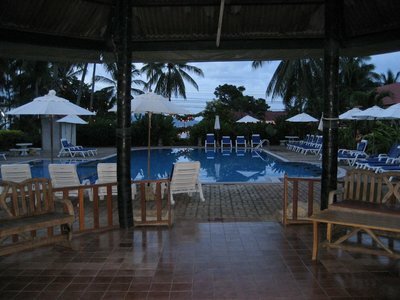 Two minutes walk away is the main beach and hawkers stalls. Five minutes gets us to Coral Cove with its stretch of virtually deserted white sand and almost clear water where we can lie under the shade of the trees and watch the crabs scuttle from one hole to another and the monkeys swing through the trees. And the food, the glorious food - did I mention our room rate includes breakfast? And not any old continental breakfast but the type of full breakfast which would blot out that price in an instant at home. Eggs, toast, fresh juice (whatever's been squeezed that morning - watermelon, pineapple, orange, mango...), coffee or milo. Some mornings pancakes, others french toast. And the other meals are delicious, safe and cheap. Last night we had steamboat. A burner placed on our table followed by a pot divided into two sections of boiling broth - spicy and non-spicy. We were given 3 plates of raw food to cook in the broth - one with noodles (two kinds) and eggs, one with vegetables (various greens, carrots, baby corns), and the last with meat (tofu, beef, chicken, squid, prawn). It was delicious! What a difference a change of scene has made! 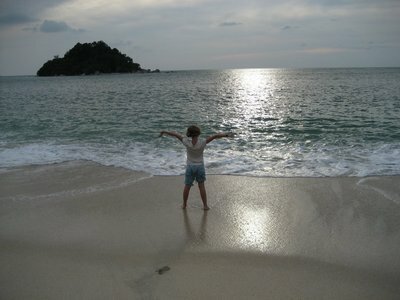 We're loving it on Pangkor Island, especially Jenn! It's rustic in a good way, not rustic in a Dickensian way. I felt exactly the way Jenn did about the KL hostel, but I wasn't sick already. The bus ride out of KL grossed me out even more. 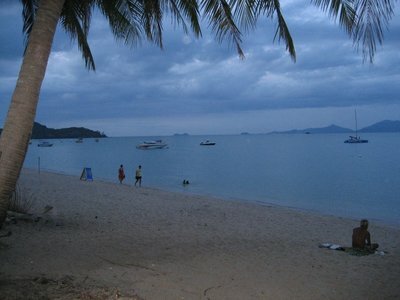 But now, beautiful beach! 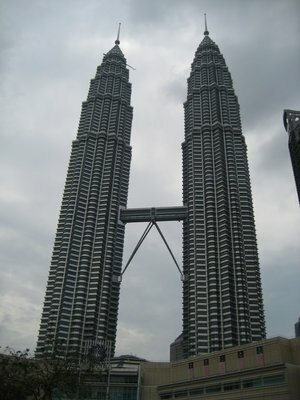 We'll write more on that later, but this entry is about what we did see and do in Kuala Lampur. Even the first night, we were so tired that we just headed for "Times Square," the biggest shopping centre in Asia. It's 10 floors, atrium-style. We soon realized it was the one with the indoor theme park, "Cosmo's World." No way we were getting out of this one, after what Anica had already cheerfully dealt with that day (bus breakdown, grungy hostel, smoggy streets, walking in the rain, not being able to hail a cab, slipping on the sidewalk tiles...). So we just said, "Anica, do you want to go the 'Cosmo's World' theme park?" She said it had suddenly turned into the best day of her life! There were a few really good rides, and some kiddie rides, and all three of us joined in. We stayed until the place was closing down at almost ten o'clock. mall. I had great Indian food for lunch, while the girls went with Western favourites - easy on the tummy. When it cleared, there was still plenty of time for Anica to enjoy the splashpark and playground at the foot of the Petronas Towers. 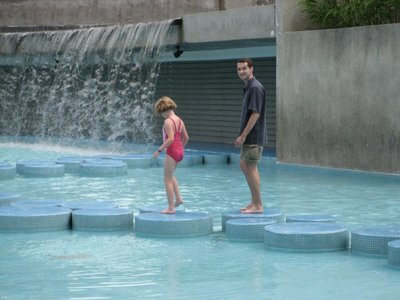 She stood under the horseshoe waterfalls and splashed around merrily. The playground is also huge, but not at all coherent. What they seem to have done is bought around 30 separate playground sets and stuck them all next to each other. The twin towers are quite pretty, mostly in shape and colour (due to their silver steel banding). They don't seem that tall, especially since the skywalk is "only" at the 44th floor. We had precisely seven minutes to spend on it when our allotted hour finally arrived. So, not quite towered out, we headed for the KL tower. It's actually taller, but not free. It's not as tall as the CN Tower, of course, but it's in the world's top 10. Anica enjoyed the observation deck there, particularly the free telescopes every few feet. Getting a cab back was typical KL, in our brief experience. First we couldn't get one at all, then only someone who would take us for 20RM. We knew that was a ripoff, and so we held out for a cabbie who would go on the meter. We got back to the hostel for just 5 RM, which shows our instincts were right. Unfortunately, the night was just beginning...(see last blog entry)! It wouldn't be so bad if I wasn't still sick - in fact, I'd probably continue to find it semi-funny, including the night manager's explanation that the rat "just" came from the sewer drain down the hall (thankfully not on our floor) - but I am, and it's just wrecking me. It's been one big yuck with some very minor moments of nice. Thank god we're moving on on Friday. The one good thing this place has done is to set the bar for Rob and I in terms of what we're willing to deal with and what we need in a place. We'll be seeing some pretty rough cities (well, starting with Melaka, but it was much closer in flavour to Singapore) and where you stay is almost a refuge at night, especially when you have young kids and need to return to your hostel/hotel earlier than average. Sometimes cheap is just too cheap, particularly when it comes at the expense of peace of mind. p.s. The night manager did make up the room beside ours for us and move us there. He said this one has never had a problem. Uh huh. Well, either way, it doesn't have a cockroach in it /now/ and that's good enough for tonight. p.p.s. The guys running this place are great. So helpful. Wonderful, wonderful guys. But the place is a pit and KL (in my estimation) is not much better. Maybe if you're staying in one of the 5-star hotels and spending most of your time being bused around the city, it's different but I wouldn't know and the majority of our experiences here have been less than stellar. Maybe when I'm feeling better, I'll try and write something more positive about what we have enjoyed.